Rates shown are for 1 bedroom, 2 full bathroom ocean front unit. Sleeps 4, two in private bedroom and two on sleeper sofa bed in living room with private bath. Ocean views from private balcony and bedroom are amazing! Full gourmet kitchen included. All bookings are from Saturday to Saturday. Additional nights can be booked directly through The Crane resort. This is a time-share. We own 11 weeks during peak season. Large living room with sofa, sofa bed, Cable TV and large dining table. Daily housekeeping service included and free long distance calls. Master bedroom with handcrafted king-size four poster bed, Cable TV and a writing desk. Master bathroom with spacious wardrobe, a large dressing area, jacuzzi bath, separate toilet room, separate spa shower with multiple shower heads and double vanity. Fully equipped kitchen with fridge freezer, oven, stove, utensils for 4, microwave and dishwasher. Large balcony with sun loungers, chairs, table and ocean view. Pink, powder-soft sand graces your feet, a lush coconut grove sways in the tropical breeze and a golden Caribbean sun helps to make this the ultimate paradise for individuals, families and couples. Once you gaze out over the sparkling waters of Crane Beach at the never-ending vista of blues, it becomes obvious why USA Today declared Crane Beach, “Best Caribbean Beach’ – 2015”. Dining: 6 on site award-winning restaurants provide an exciting culinary journey. From the Old World tastes of Southern Italy to the delicacies of Japan and Thailand, explore a world of epicurean delights right on-site. Two bars and a beachfront and pool side bar. 6 outdoor pools. The centerpiece Historic Hotel pool is set at the top of a cliff, overlooking the spectacular Crane Beach. In addition, the fabulous Lagoon Pool is situated cliff-side, offering a multi-pool complex of four pools including children’s wading pools and a waterfall pool. There is also an alfresco Jacuzzi spa pool, positioned against a beautiful backdrop of the ocean. Large luxury pool towels are provided complimentary for the use of resident guests. There are a variety of restaurants and bars (with nightly entertainment) within resort, including International/Caribbean, Thai/Japanese, Italian, poolside and beach bar & grill and an ice cream café bar. There is a Serenity Spa and Wellness Centre, a gym and yoga, floodlit tennis courts, a general convenience store and a duty- free retail shopping village. Most of these facilities are only available to residents of The Crane. Utility Room: Large built-in cupboard contains washing machine and tumble dryer. Cleaning / Towels / Linen / Maid service: Towels and linen are included, which are changed frequently/as requested. There is a daily maid/room service. Other: This residence features a full guest shower room, off the living room to facilitate those using the sofa bed. The two bathrooms continue to mix luxury and comfort. There is outdoor furniture on the large balcony. We have never needed AC due to cool ocean breeze, however, AC is available. The resort charges $1 US per hour for AC use. We have traveled extensively throughout the Caribbean and have fallen in love with Barbados. We are celebrating our 25th visit to Barbados and our 25th wedding anniversary. We have owned a timeshare in Barbados since 1992 and watched the Historic Crane Hotel transform into a unique luxury resort that we currently enjoy. We now own 11 weeks and enjoy renting our units to friends and family. 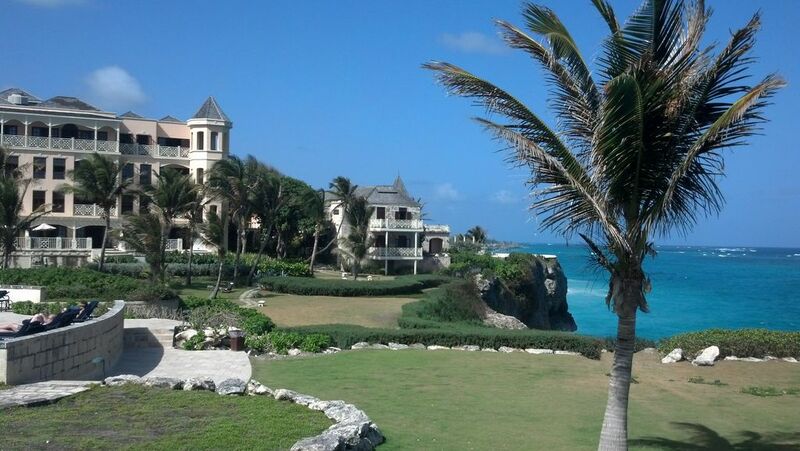 This resort is the oldest in Barbados, first opening in 1887. It is a blend of restored history and new buildings traditionally furnished with handmade mahogany reproduction antiques. The service and furnishing blow us away! Located in The Crane Residential Resort, one of the top resorts in Barbardos! All resort amenities are included with this rental. Crane Village at resort for shopping, food and drinks! The resort charges guests $1 US per hour for AC. We have never needed to use it. Cool ocean breezes are all we need. Daily housekeeping services included at no extra cost. building has two modern elevators. there is even an elevator to the beautiful Crane Beach! Wonderful stay and no issues booking through Home away. Thank you for the wonderful review. Glad that you enjoyed the magnificent Crane resort! We rented this wonderful 2 Bedroom deluxe garden Suite from chuck Whitmore who was extremely responsive and helpful during the inquiry and booking process. The suite was wonderful and spacious, lovely furnishings, private garden, pool, patio. We spent much of our time outside. The resort is phenomenal in every way. Beautiful landscape and scenery. Great beach and pools. We loved it all! Thank you Nadine and family for the great review. We are very glad that you enjoyed The Crane as much as we do. You were wonderful guests. All bookings are Saturday to Saturday. Advertised rates are for Ocean Front One bedroom two bath, full kitchen unit. This is a timeshare at The Crane Resort. We own 11 weeks in this specific unit for weeks 6-9 and have floating weeks available to allow you to book other weeks through the year.